All tractor-trailer drivers need to understand the vehicle dynamics of a jackknife and how to prevent one. If the tractor-trailer starts to jackknife, immediately take your foot off the brake (and/or fuel), feather the clutch, and correct the skid as you would normally. Jackknifing can occur more easily with empty or lightly loaded trailers or when the weight of the load is poorly distributed. The tractor and trailer brakes are designed for use with a full load, and as such, are sub-optimal for an empty or partially loaded trailer. Air brakes have a different feel than regular brakes as found on a car or SUV. Air brakes have what is known as “brake lag” and the brakes may feel spongy. Exercise caution on slippery roads. There have been situations where the tractor-trailer lost traction before cresting the hill. 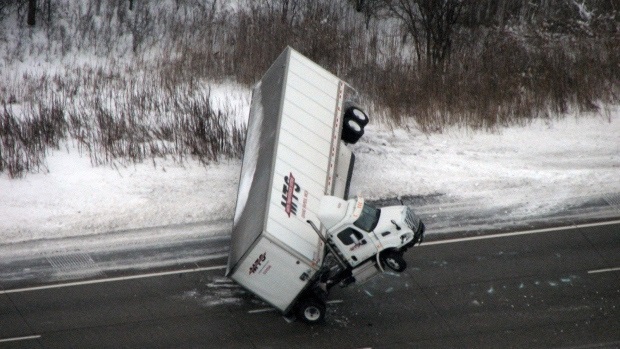 The truck and trailer then slid backwards down the hill, jackknifing on the bottom. Equip the tractor with tire chains on icy roads (if permitted or required), or do not attempt to drive if road conditions are poor. Never use the “trailer hand brake,” if so equipped, in a jackknife or skid. Use of the trailer hand brake will make the situation worse. The idea is to regain control of the vehicle. Panic braking will guarantee a slide-off, skid or jackknife. Smooth driver inputs and keeping all tires rotating at the same speed will help to maintain control or regain lost control of the vehicle. • Always slow before turns and curves. Braking while turning or in a curve can lead to a jackknife. • Reduce speed gradually. Stay off of the brakes in slippery conditions. Slow means slow. • Increase following distance for conditions. • Always maintain pull on the trailer. What this means is that after slowing before a curve or sweeping curve, “pull” or lead the trailer through the curve with a little power (feather the fuel). Turns at small intersections, however, should be done slowly, at idle speed. • Engage the inter-axle differential on slick upgrades. • Disengage the inter-axle differential on slick downgrades. • Avoid “emergency situations.” Slow down before turns and curves and intersections, and/or going downhill. • Do not use an engine brake in bad weather conditions. The inter-axle differential lock or Power Divider is for use in low-traction situations only. Read your operator’s manual for full instructions an specifics! The inter-axle differential is not meant for use on dry pavement. — The vehicle is not on a curve or in a turn. An inter-axle differential (IAD) works in a similar manner to the main differential (splitting power between the two wheels), except it splits the torque equally between the two axles of a tandem, rather than the two wheel ends of an axle. What happens if you engage the diff lock when the wheels are spinning? You may hear a grinding sound and feel vibration while the diff lock tries to engage. What happens if you leave the diff lock on while driving? Driving with the diff lock on will cause high stresses and strains in the drives, and can result in accelerated component wear or even catastrophic failure. Flip the switch and press the clutch briefly (some recommend to feather the clutch, as in a normal shift); do likewise to disengage the lock. Caution: You should not activate the differential lock when the wheels are spinning (when traction has been lost and/or the tandems are rotating at uneven speeds). Note: Some trucks may be equipped an alarm (that sounds like like a low-air warning alarm), to remind the driver to shut the interaxle differential lock off. Some trucks may have a warning lamp or light on the dash or the switch itself. DCDL is an option on some vehicles, that is manually turned on and off by a switch. DCDL allows maximum traction potential to each wheel end of an axle. DCDL is to be applied only as needed (for very short periods of time and at low speeds due to the possible handling characteristics of the vehicle with the lock engaged). Note: Proper operating instructions for any of the above systems vary from manufacturer to manufacturer. Always refer to your owner’s manual for further instructions. Winter Tip: Never enter a dry roadway when the wheels are spinning (like from an icy driveway). A sudden grab of the pavement while the wheels are spinning can send a shock to the differential and blow it out. Training Tip: Have your drivers attend a tractor-trailer skid school in your area. Skid-school may last from 1/2 a day to a full day and its a fun way to master a jackknife or skid situation under controlled conditions.